Often you see miniatures in contests like golden daemon or iron painter having a kind of awe around them that impresses you. Often this is done by exceptional painting skill but in an area where lots of people have quite matching skills you’ll notice the winners often have a very nice and decorative base. I will not go into all of the subjects of dressing up your base, but what I will look into is the way natural bases are made up. 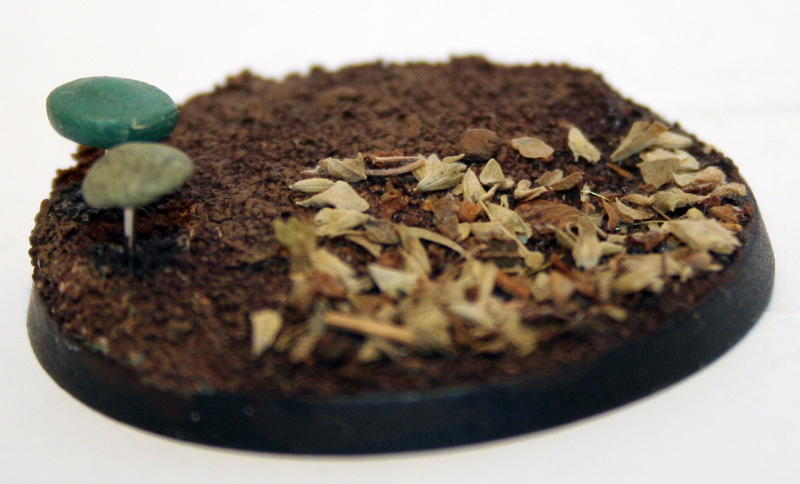 I am currently working on a jungle themed army and thus I shall use this as an example of how to create realistic looking bases that give you the edge over your peers without making it too difficult. First off you’ll need to get yourself acquainted with the type of surrounding you’d like. This kind of pre-work is mostly forgotten and you’d be surprised to see how much it helps to do just a bit of research before starting your project. 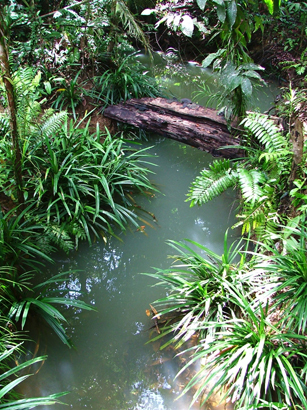 Some quick research yielded me these two images of a jungle stream. The right is a picture taken in the Amazon in Brazil, while the picture on the left was taken in the south-east Asian archipelago. The first thing you see is the difference in water color, the debris/rotten foliage in the water, the low plants directly on the water’s edge and the taller plants further land inwards and the various sticks and branches lying or hanging about. Note these things for yourself in every image you review for your research so you can replicate these while creating your base. Now this of course is done for a jungle base, but any type or natural ecosystem based base should be given some research to improve the realism of the base. Now we know about research it is time to put in some practice. Every base of course starts with its base. I will be using a 40mm base so I can fit most of the explained techniques on it but smaller bases should do just as well. I tend to stick to sand or fine gravel as a ground base. In this base we’ll be using a stream to enable so aquatic or swamp foliage. To do this I first made a bank out of putty to create depth between the soil and the stream and glued on sand afterwards. Note from our research images above, that there’s more foliage in the water then on the banks surrounding it. 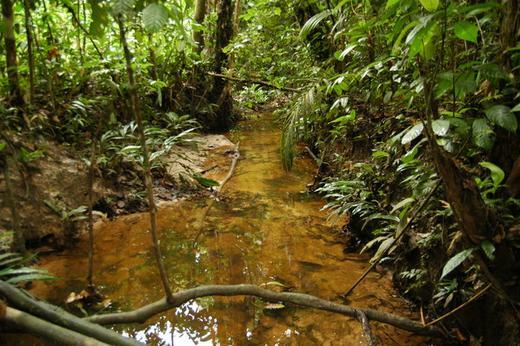 The stream on the left is less clear and deeper than the one on the right and if you where to try and simulate this you’d do well to paint the soil in a darker hue where you’d be adding water later. 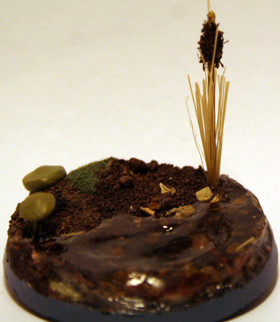 I‘ve chosen to paint my bases in a dark brown soil tint like the south American jungles so started off with a dark brown color similar to GW scorched brown. After it had thoroughly dried (that’s a step where I often screw up) I use a stiff brush with a bit of paint to dry brush the next layers of paint. As most of the ground is going to be covered, I don’t feel it necessary then to go over the first layer with more than two highlighting colors. In this case I’ve used a kind of bestial brown and Vallejo model colors Flat Earth. To mimic the dead leafs there are a few techniques you can use. What I used was dried kitchen herbs. You might look into your kitchen or supermarket for these or hack them up yourselves. The best looking are very fine leafed herbs as they have a more natural shape. On the base here I’ve used dried basil and oregano, based on what I had available. The small leaves and leaf parts have a natural tone to them already and if you want to darken them up you can use a wash. As the leaves are thoroughly dried they will easily soak up the wash and absorb its color. The most used form of foliage is grass of better yet, static grass. The stuff’s available in many colors although most people just tend to use spring tone. So far I haven’t found any way or coloring them the way I like without destroying their texture so I make sure I have several hues at hand. Jungles don’t tend to have much grass in them, so I’ll stick with the theory here. (I will be using a flock blend but I’ll get back to that later.) Depending on the coverage I want to achieve (a thick and lush coat or a meager and little grown coat) I use white glue or super glue respectively. Super glue tends to work easier for getting the fibers to stand up straight though the thick consistency of white glue helps achieving a lush growth. The best way to apply static grass is to apply a dab of glue to the area where you want the glue to be. 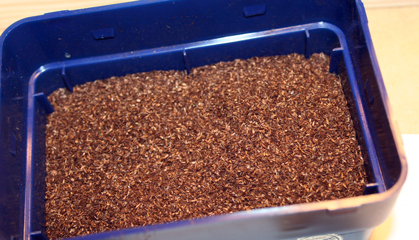 Next give the container a shake to load up the grass with static energy and sprinkle the grass on the glue rather than dabbing it. The static nature of the fibers will more likely stand up straight this way. Over sprinkle and let it dry fully. (This may take over 10 minutes for white glue!) Now tap off the excess and gently blow from the side to help lift the fibers. There you have it. Lush grass! Now we have the most basic ways of basing done we go to a little more difficult yet often used form of growth in the form of mushrooms. 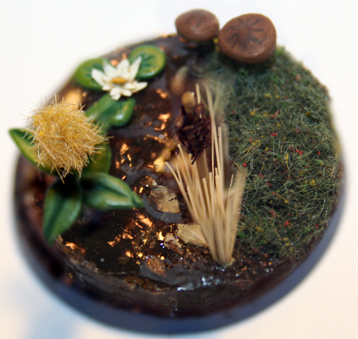 Mushrooms are very easy to make and add a lot of detail to your base. Again research by google:ing mushroom or even fungus or fungi and see the abundance of different mushrooms available in both shapes as well as colors. Here we’ll be using the most generic type with a flat hood. (See figure 1) Due to the scale our mushroom suffices with a pin as its stem. More complicated ones might need a thicker stem which can be achieved by wrapping the pin in some putty. I made mine from a simple disc of putty in which I pricked the head of a sewing pin. This I pricked through the base and cut of the sharp end at the bottom. Be careful here not to lose the pin and step in it! After drying the hood is painted in the appropriate color. Reeds and cattails are one of the easiest more advanced forms of foliage available and none spell out an aquatic base more so. To create reeds I simply use a modelling product that is made for this purpose, but you could just as easily use broom fibers or hairs from rough house painter brushes. Simply stick a bunch of the reeds together and try not to have an exact length to the independent fibers as the randomness gives it a more natural feel. Most people like to stick the bunch in a dot of PVA and do just that, while I tend to drill a hole in the base and stuff the reeds in there. 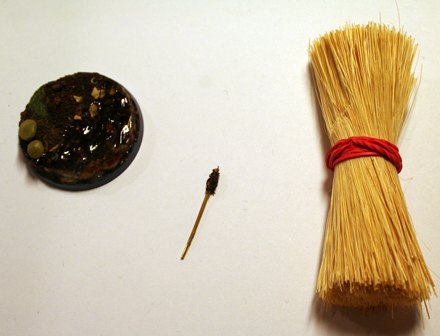 Afterwards I insert the cattail to seal in the fibers. Lilies are one of the most to mind springing plants in an aquatic environment next to reeds. Therefore we’re going to make some easy and realistic looking lilies. First start by mixing some putty (I used greenstuff here) and make small balls off of them. Then cut out a pie piece as shown in the diagram and finish by making small indents to look like the plant nerves. Lilies tend to have pointy leaves and this small tutorial can be used as basis for any type of flower but since the lily is white (as is the paper) this is one of the easiest. Begin by making out the basic shape on a piece of paper. I free handed it so created a four pointed star for my lily, but as uneven numbers tend to look better you might want the use the stars in the diagram. Cut out the shapes out of paper. Keep in mind that the largest shape should roughly be as wide as the flowers head. Next cut out the other shapes of paper and stack them onto each other. Make sure the points (which will function as petals) no not overlap but rather alternate each other from one layer to the next. Glue them together and where necessary insert a piece of greenstuff to symbolize the stamen etc. Paint the flower in the desired colors and there you have it, your very own lily. For the plant shown in the picture I used the same technique as above for the leaved. First I rolled a cone out of greenstuff and flattened it with my scalpel. Next I used a clay shaper tool (but modelling tools with do as well) a nerve groove through the center of the leaf and left them to dry. When dry I used the hollow end of a ball point tube to press away an indent for gluing the leaves to the stem. For the stem again I used a brass rod painted green this time to which I super glued the leaves. 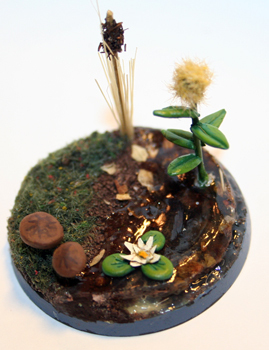 The flower itself I made using a small ball of greenstuff as a base. The way it looked it could have been painted to look like a tulip. (Hooray Dutch glory!) This I smeared with PVA glue and dipped it in a flock blend. (Straw from galeforce 9) You can also do this with various types of static grass painted over in the color you want for your project.